One thing I love about Easter is chocolate, mmmmm chocolate! But one of my favorite things to do is make my own candy. I love doing this because the flavor is so much better, and the smiles of homemade candy is enough to please me and everyone who tries them. 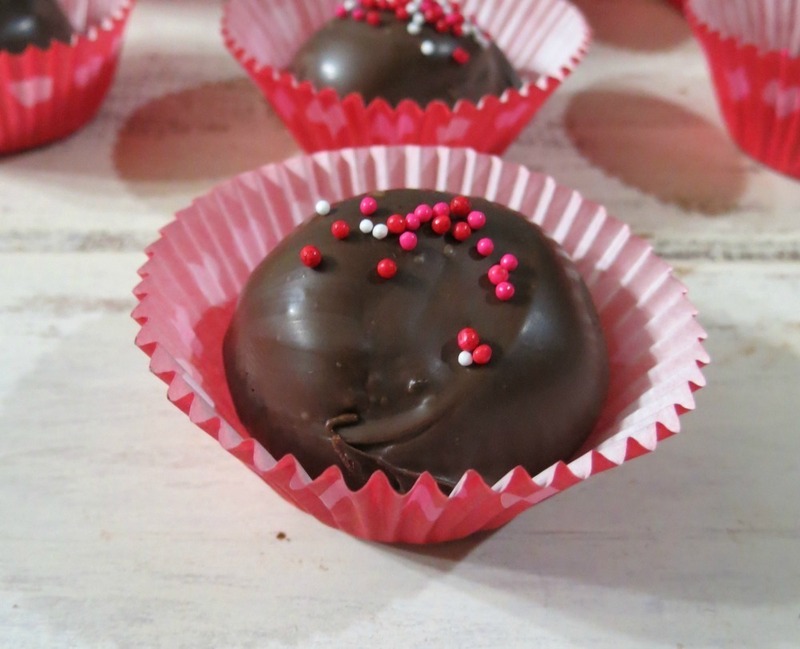 Today’s candy treats are so easy to make and the flavor, oh the flavor of these candies blows my mind. These are my Dark Chocolate Cashew Turtles. 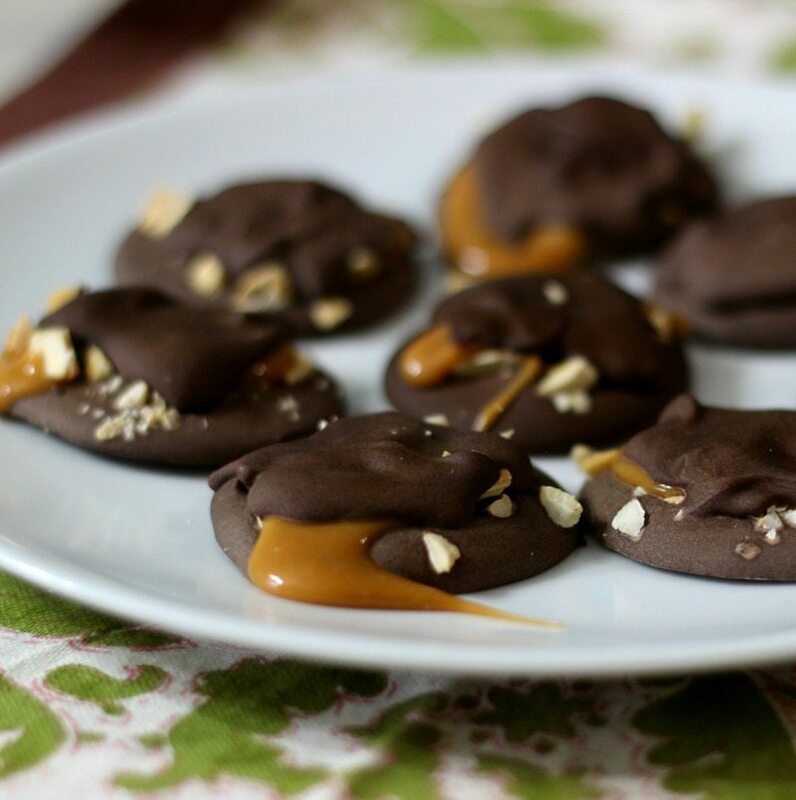 They are made with dark chocolate melting wafers, Caramel bits and salted cashews. Talk about a sweet and salty treat. 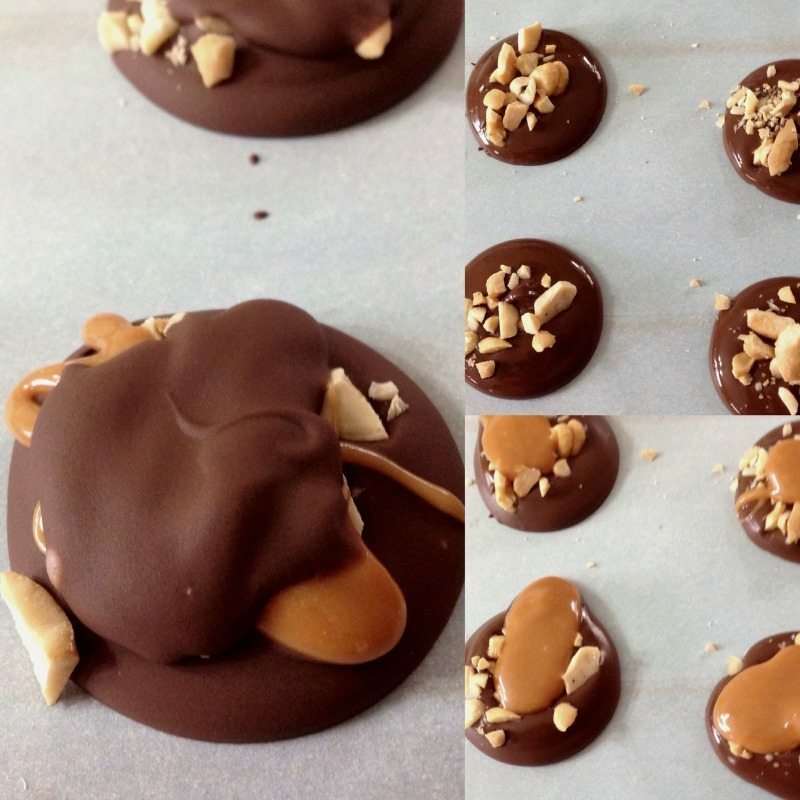 These are my spin-off of Turtle Chocolates, but I love cashews so much better than pecans. 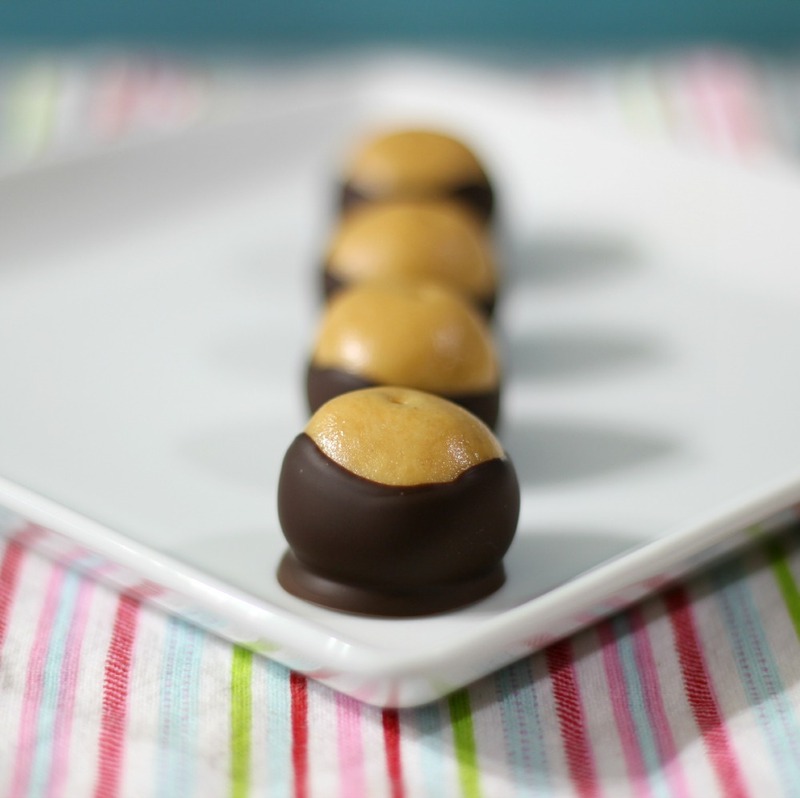 The candies are sweet and a little chewy from the caramel and a little crunchy from the nuts. They are perfect for giving as a gift and I think perfect for making for Easter. It beats the bagged candy chocolate in the stores. To make them I took Ghirardelli Dark Chocolate Melting Wafers, melted them and adding two teaspoon size onto a parchment paper. Take the chopped cashews and place on top of the chocolate, let it set for a couple of minutes. Then I took Caramel Bits and melted them in the microwave for under a minute until it was melted. 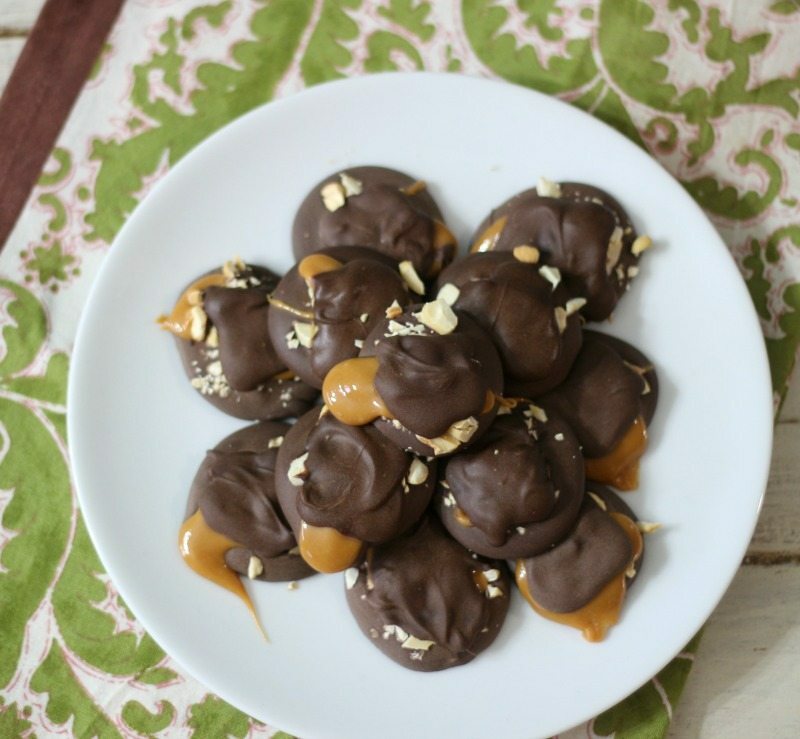 Have you used Caramel Bits? They are just like the caramel square candies that are wrapped up, but these are easier to use when it comes to candy making and cookies too. I added a teaspoon size of the melted caramel onto my chocolate and cashews. Then the last step is to melt more chocolate wafers and drizzle it over the caramel. Let the candy sit until firm. It’s so easy. I made 31 of them in about 30 minutes. I don’t recommend chilling the chocolate because it gets dull in color, however if your house is warm I recommend it. 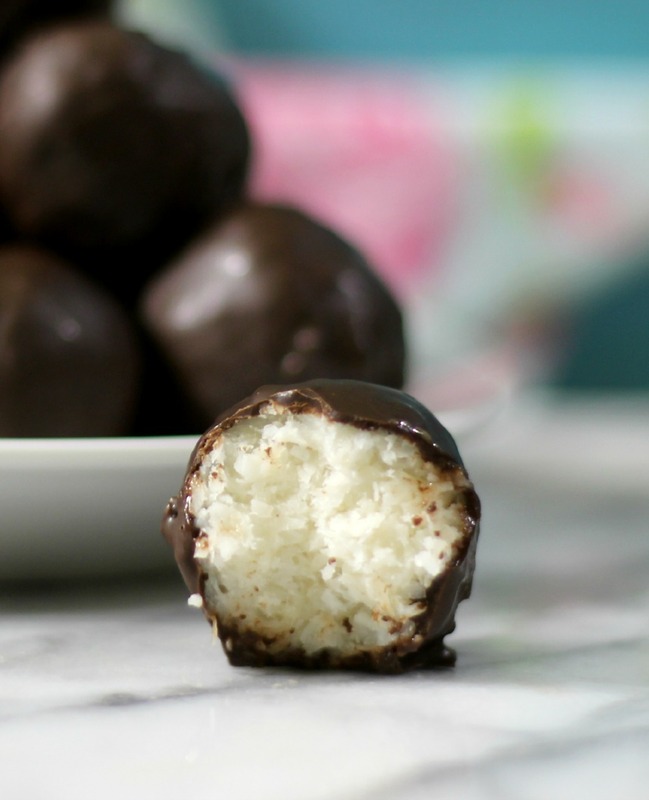 These are wonderful at room temperature or in the refrigerator. Rich dark chocolate, creamy caramel and salty cashews makes for an indulgent candy that is perfect for gift giving. Line your counter with parchment paper. 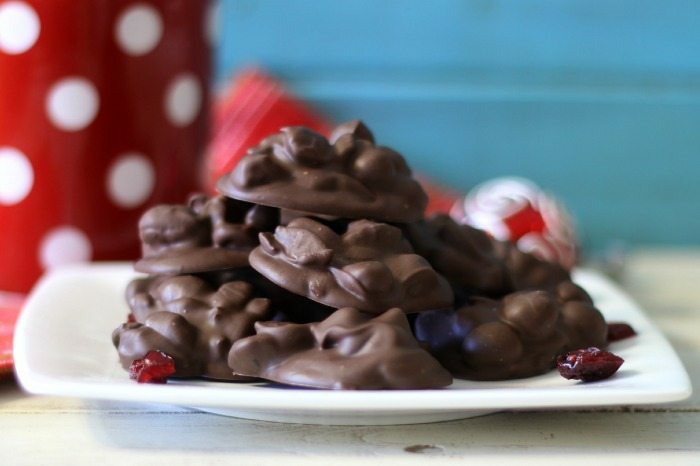 In a microwave safe bowl, add 2¼ cups dark chocolate wafers. Melt in the microwave for 30 second increments, stirring in between each increment. I found 90 seconds worked best. 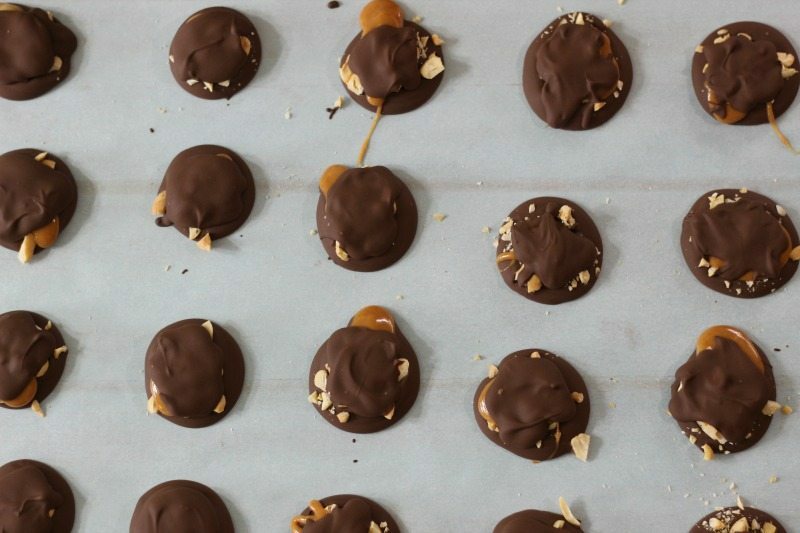 Take 2 teaspoons of chocolate and drop onto parchment paper. Evenly sprinkle each chocolate evenly with cashews. Let cool. In a microwave safe bowl, add caramel bits with 1 tablespoon of milk. Microwave for 30 second increments, stirring in between until melted. About 60 seconds worked best for me. 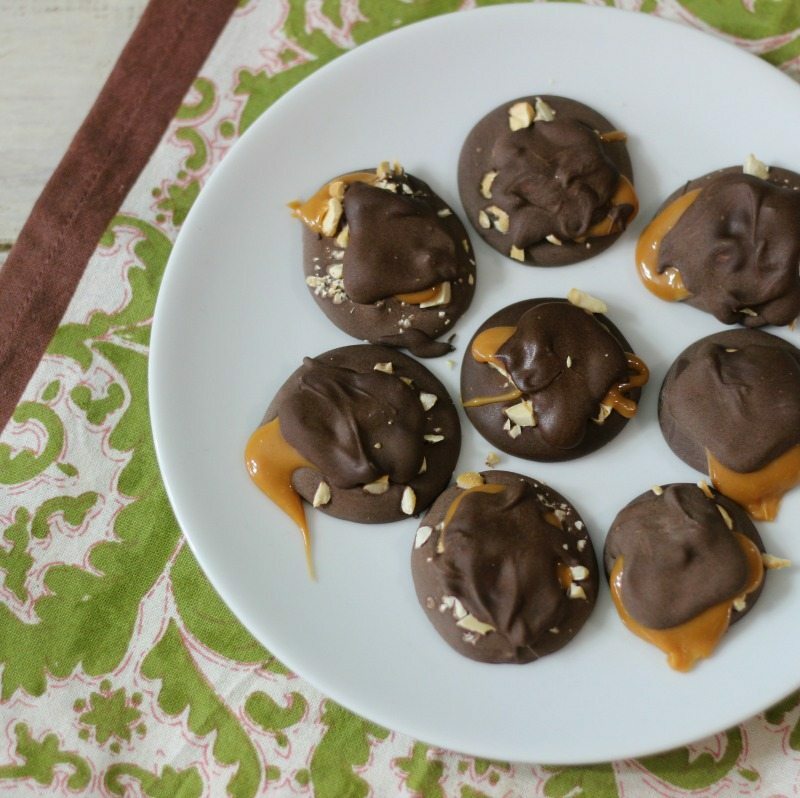 Take about 1 teaspoon of caramel and place on top of chocolate and cashews. Let cool. NOTE: I had leftover caramel. 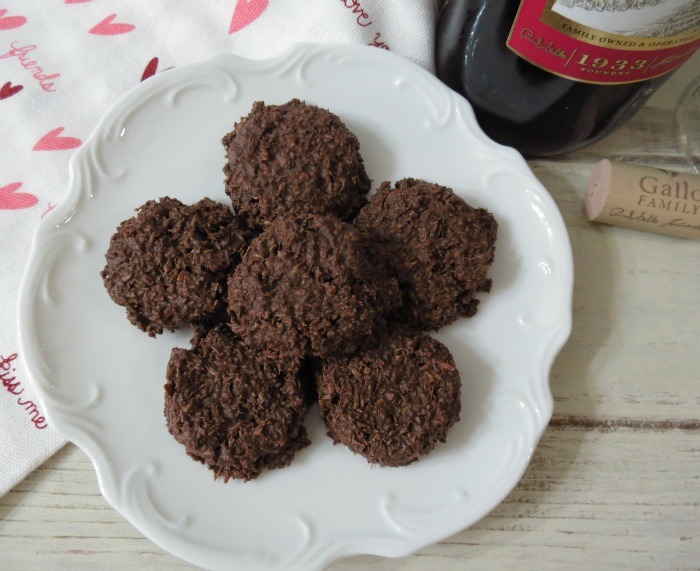 The recipe uses about ½ cup but it's easier to make when you use a little more. In a microwave safe bowl, add 1 cup of chocolate and melt for 30 seconds, stirring in between increment. I found about 50 seconds worked best. Drizzle 1 teaspoon of chocolate over top of the caramel. Let cool. Store in the refrigerator in a sealed container. Can be stored at room temperature if your house is not to warm. I kind of want to make these again. They are so yummy and so easy. One candy totally satisfies my chocolate crave. 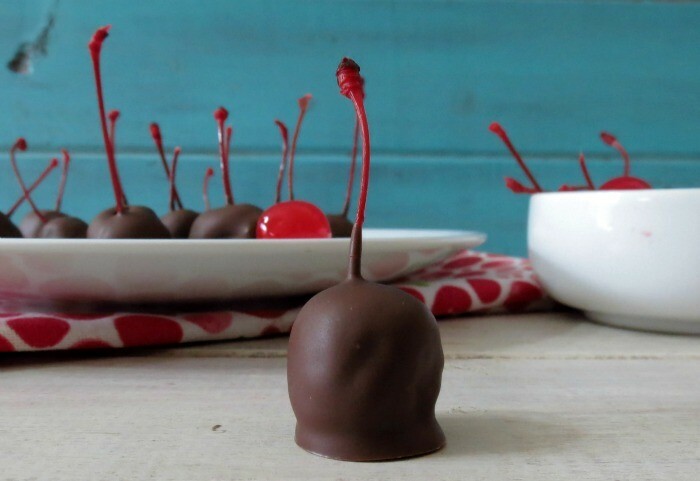 If you like making candy, here are a few simple recipes that you can make. Have a wonderful rest of the day! Dark chocolate, nuts, and caramel are a few of my faaaavorite things!